Sarasota Massage - Mending Hands - Melissa Finley - SRQ 34239: Yelo's Breast Cancer Awareness! 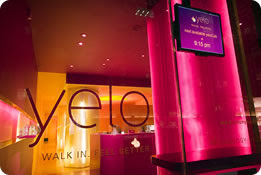 I had a conversation with Michael Hazel the Director of Operations at Yelo - the amazing spa that offers busy city people a combination of power naps, reflexology and full body massage treatments in the heart of New York City. I am proud and excited to announce that Yelo has reached out to support Mending Hands and I will be reporting my experience with their state-of-the-art YeloCabsTM as well as a massage treatment with Anna Crean-Weiner, Yelo's Lead Therapist soon! ...is that Yelo has joined Pretty City's Pretty in Pink - in a generous effort to support Bright Pink - the only national non-profit organization with an exclusive focus on the prevention and early detection of breast and ovarian cancer in high risk, young women. Since Yelo is a participating “pink” location they are offering some deeply discounted treatments for ALL 31 days of Breast Cancer Awareness Month for the price of just $31. I encourage all of you to call them up at 212.245.8235 to take a nap, get a massage or a foot scrub all in the name of Breast Cancer Awareness!